This giveaway is sponsored by Assemble. Assemble is an open physical space in an Urban Neighborhood in Pittsburgh. We unite artists, technologists, and makers with our neighbors of all demographics. Assemble provides a platform for experiential learning, opening creative processes and building confidence through making. Assemble envisions a diverse community that creates, connects, and learns through the experience of art and technology. We have a cool giveaway for a chance to win a set of 4 classes for Complimenting Pittsburgh Art Class for two people! Maybe you've always wondered how you would do in a painting class, but didn't want to pay for classes. Maybe you love being artistic and here is a great chance to pursue your creative side! It would make a set of fun dates for you & your spouse - even if you're both not artistic, you could still make it fun together! Or you can grab your mom, sister or bestie and enjoy a little girl time. Either way, this is a cool & unique opportunity to explore your creative side! Learn to paint scenes of Pittsburgh with local artist Ryan Ian McCormick. This course teaches students how to use just two colors (complimentary colors) to create vibrant scenes of The Steel City. The "complimentary color technique" was invented by McCormick. He created this approach due to his colorblindness and inability to see "in-between colors." So, come out and learn this new, and unique way to paint landscapes of Pittsburgh! You can either bring a photo of a scene you would like to create, or there will be photos of Pittsburgh on hand to work from. You don't have to have any experience to participate, just a willingness to have fun during the creative process. The class is geared toward adults and teenagers. This is the package for all four classes( June 15/ July 20/ August 3 and 17). Please note: this giveaway is beginning after one class has already been completed on June 1st, but they said it would not affect those taking the following 4 classes. 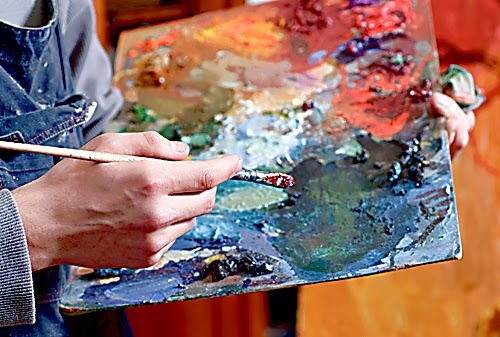 The class starts promptly at 11 a.m. and runs until 3 p.m. One hour before the class starts (10 a.m.) there will be a workshop/ open studio to work on paintings from previous classes. There will be an open studio on July 6th at Assemble from 10 a.m to 2 p.m., free to anyone taking the class. Also, there will be a reception on August 24th ( 4 to 6 p.m.) at Assemble where anyone who participated in the class will be able to display their work. Each class will concentrate on a different color combination, a different scene of Pittsburgh and aspects of composition and technique. Included in the price of the five class are brushes and acrylic paint to use, professional instruction, and a 14" x 18" canvas to take home each class. There will also be some light snacks and tea on hand. You are also welcome to bring snacks and drinks if you wish. I want bring my mother in law to the painting classes as i lost my mother a few years ago. When your kid is being force behind you in a very trailer or is seated behind you on a rear mounted seat, you may realize that you simply area unit worrying regarding lots of things as a result of you cannot see him. Has his helmet slipped or did he tossed his shoe out many blocks ago? what's he doing back there? With the front mounted seat, you may realize that you simply will simply look down and check that that everything is okay.